The Pakistan-China friendship is deeply rooted and has always been judged an exemplary one since its establishment. It is because of this very fact that the people and governments of both the countries vehemently claim that their friendship is higher than Himalaya and deeper than ocean. While having glance of the present day developments, one finds the brotherly relationships between both the neighbors. The wholehearted and sincere contribution on part of People’s Republic of China to Pakistan in its infrastructural development is above board; the diplomatic support is internationally acknowledged and their commitment to continue with their established friendship traditions seems un-shakable. When in difficult hours, Pakistan pins expectations with its arch friend, People’s Republic of China and has never been dis-appointed. The pace with which the China Pakistan Economic Corridor is implemented, the project seems guaranteed to be materialized with success. Not only the Gawadar port is going to be linked with China through communication systems – the highway network in particular but all the 43 major projects will also be developed in the first phase. Almost nine mega projects under CPEC have already been completed while 13 are under implementation stage. The speed with which the CPEC projects are implemented, there exists every hope that the day is not far away when it will be fully completed. Although, hardly there exists any doubt, as far as the CPEC implementation arrangements are concerned yet the common citizen is equally justified to be anxious to know about the pace of progress and that is why these words are being contributed. Anyhow, it is not difficult to assess the magnitude of the contribution which the CPEC is going to share in socio-economic well-being of the people of Pakistan on its completion. How much number of people are to get direct employment is also not a hidden notion rather being admitted as a visible reality. Further, it is the project which will be going to benefit the entire country and therefore transmission of information on implementation process is bound to make value addition of it as well. Keeping in view the geographical scenario, the Afghanistan may prove an important beneficiary of the CPEC as well. It seems a common desire of both Chinese and Pakistanis that the Afghans may also benefit from this multi-sectorial project for getting their socio-economic uplift ensured but subject to restoration of peace. When one talks about expansion of economic and trade activities in Afghanistan it would be difficult to oversight the importance of the historic City of Peshawar. In other words, the CPEC seems the revival of time old history. It is because of this very fact that the Ambassador of the People’s Republic of China in Pakistan, H.E. Yao Jing aspired to having an exhibition football match and his sincere feelings were equally shared immediately. Resultantly a fantastic football event was held between the Khyber Pakhtunkhwa and the Chinese Embassy teams at the picturesque city of Abbottabad during the second half of 2018. The successful conduct of the match led to the visit of Chinese cultural troupe to Peshawar where they had performed in a five star hotel.The interesting fact of the scenario is that it was the first activity of the kind on part of the Chinese cultural troupe over the past almost 18 years which was warmly welcomed as well. 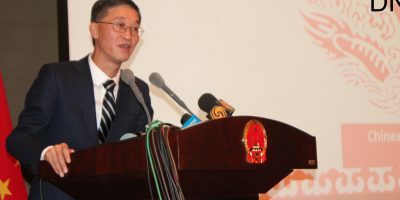 On successful conduct of both the aforesaid initiatives, the Chinese Ambassador further went ahead and arranged the Chinese National Day function in Peshawar shortly – the first ever ceremony of the kind in Peshawar which also proved highly successful. All this strengthened the realization that Chinese Embassy was quite conscious of its role in promoting relationships at people level between both the countries. A Peshawar based senior Pakistani journalist, Amjad Aziz Malik have been the motivating force in getting all the three initiatives materialized who has been promoting the soft image of the country for quite some time. Presently he is also rendering his services as the Secretary General of AIPS ASIA,(Asian Sports Journalists Federation) and gaining fame not only for himself but also for the country. These success stories will always be judged the golden chapter in the relationship history of both the countries. The success story also promoted attractions for bringing Peshawarites closer to their Chinese friends. The establishment of Chinese Window in Peshawar which is also known the city of flowers is the latest development in this respect. While entering to the well decorated premises of the window one is mistaken to be in China. The intelligent use of red colour coupled with establishment of the various galleries of the Centre have made it a highly attractive opportunity. The outer wall of the Centre is decorated with portraits of Chinese artists and pictures of musical instruments. The hanging pictures with length and width of 60 and 7 feet respectively along the front wall present a very beautiful look. Further a big photograph of famous Chinese Wall offers top most attractions whereby the visitors take selfies and upload their pictures on social media. All this mistakes one to be witnessing a real part of China. At the China Window, the first gallery offers information of Peoples Republic of China wherein pictures and photographs of different sites of the country are also available while the second gallery covers the socio-economic progress of the Chinese friends. 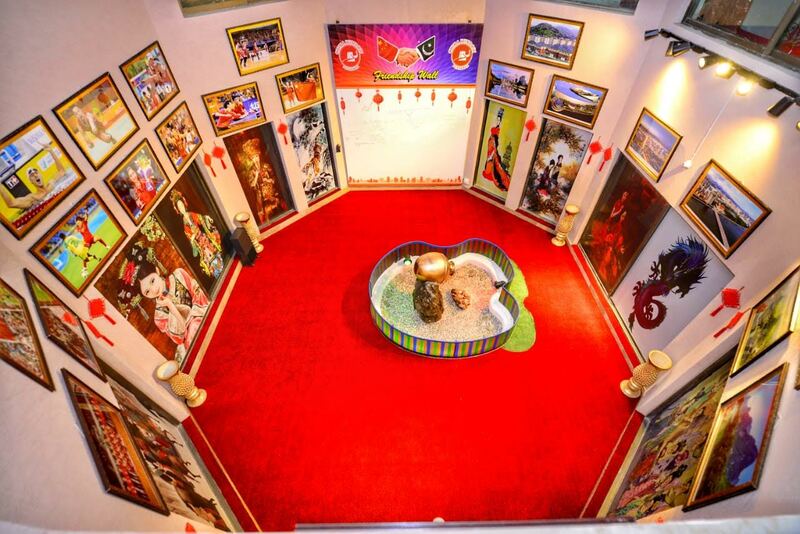 The third gallery is solely dedicated for Pak-China Friendship. The meetings took place between the various tiers of leaderships of both the countries from time to time are portrayed in form of pictures herein whereas the fourth gallery takes the visitors to know about the initiatives and achievements in respect of poverty and corruption elimination related initiatives and achievements. The CPEC Gallery attracts the business and trade community in particular besides the common citizens. The giant and huge photographs of renowned Chinese artists apart from gold medalist sportsmen and various provinces are the worth seeing. The Chinese Window also compasses a mini theatre wherein the guests may watch documentaries of 5 to 10 minute duration. A plan is also in the offing to initiate Chinese language learning classes at the China Window and hectic preparations are already underway for this purpose. The inaugural ceremony of the China proved an added experience when the Senior Provincial Minister for Tourism, Culture, Sports and the Youth affairs formally re opened it by cutting a tape in a colourful ceremony. All this proved an impressive development. While talking on the occasion, the provincial minister was of the view that their government is going to establish a China City in the province in near future. 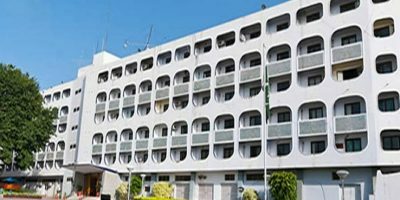 Further, they are also planning to observe a week on the close neighbor friendly country as well and apart from within the host country, delegates will also be invited from Peoples Republic of China, Iran and Afghanistan. He also held out an assurance of the provincial government to extending every possible support to the management of the China Window to make it a success story under a well-documented arrangement. ning of the China Window a big initiative which, he added, is a need of the hour. 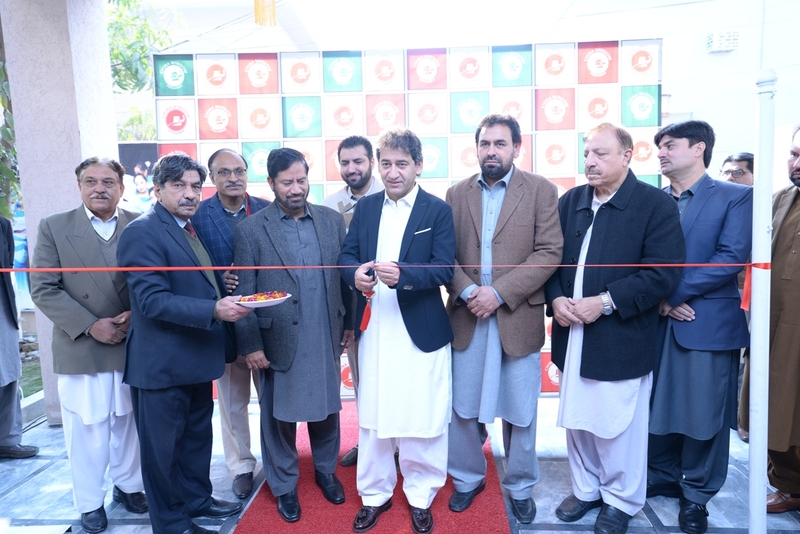 With the establishment of the window, he said, people of both the countries especially the Peshawarites and other residents of Khyber Pakhtunkhwa province of Pakistan will enjoy better opportunities to know about their friendship and its outcome especially help in promoting the cultural activities of each other and strengthen the mutual bonds of cooperation. While responding to a question, the Senior provincial minister, Mr. Atif Khan said that the CPEC has become an extra source of strengthening of our relationships with China which also encouraged us to establish the China City in our province – required land for which has already been acquired. On completion, all such projects will significantly contribute to further cementing the bonds of relationships between both the countries. 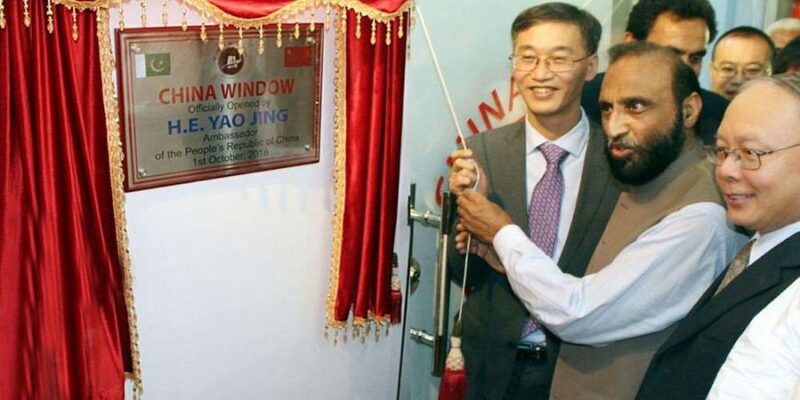 Truly, he added, the establishment of the China Window in Peshawar is a pleasant addition in respect of all such efforts – when such an initiative is taken by the private sector, it beyond doubt gives a special pleasure. He also wished the launching of China language learning arrangements at the earliest which also is a need of the hour in wake of the importance of the CPEC. He has assured to extending due support to the China Window towards promoting the China language learning activities. Indeed the China Window is proving a good source in generating opportunities of social contacts, encouraging locals especially the women folk to learn preparation of Chinese foods and holding literary competitions amongst students. The ultimate major beneficiaries of all such activities are no doubt the residents of Khyber Pakhtunkhwa especially the Peshawarites. To our utter astonishment, within few days of the establishment of China Window it received the Speaker of the provincial assembly, Mr. Mushtaq Ahmad Ghani; the members of provincial assembly, Nigaht Yasmin Orakzai and Sumaira Shams; the Vice Chancellor of the University of Peshawar, Prof. Dr. Muhammad Asif; additional inspector General’s of Police, Mr. Shahzad Aslam and Mr. Feroze Shah and an ex-Chairman of Pakistan Cricket Board, Dr. Naseem Ashraf amongst almost 500 dignitaries and prominent citizens. Now the China Window is proving a big source of attraction for the students of schools and colleges in particular and visits by the inmates of the institutions of Peshawar and its surrounding areas is becoming a routine practice. Amongst the visitors the government officials are taking special interests in the working of the window whose visits are also proving a source of strength for it as well. In the days to come, the China Window seems to taking a visible place amongst all the contemporary arrangements to promoting mutual cooperation and understanding at the people level between both the countries.